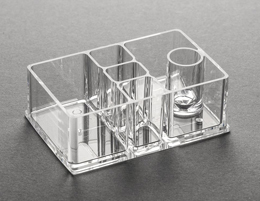 On-chip Sort performs cell analysis and cell sorting using a disposable microfluidic chip. There are two types of microfluidic chips for sorting: 80μm x 80μm size channel chip for cells up to 60μm; and 150μm x 150μm size channel chip for large particles up to 130μm. All fluidics and reservoirs are fabricated on the disposable chip and that makes it possible to be free from contamination between samples nor contamination to the instrument. The instrument does not have any sheath tanks. 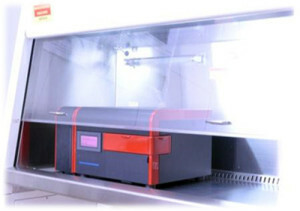 This lead to the realization of this miniaturized system, and the instrument can be installed inside a standard biosafety cabinet. The chips are fabricated in a cleanroom for spotless finish, but we also provide sterilized chips to ensure aseptic sorting environment.